The Superman titles have course-corrected a lot in the beginning of the New 52, after George Perez left, Dan Jurgens and others filled in for a while, and Scott Lobdell came on and almost immediately turned to the "H'el on Earth" crossover. In this way, Superman Vol. 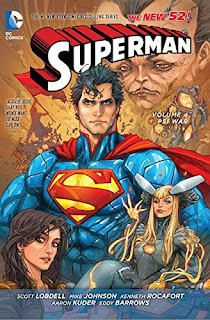 4: Psi-War marks really the first dedicated Superman-centric volume of the definitive New 52 Superman, by Lobdell and Supergirl's Mike Johnson (while Lobdell filled in on Action Comics). The result is a mixed bag; not perfect, but nothing I'd dismiss out of hand. The up side is that Lobdell's chapters focuses a lot on Clark Kent -- somewhat under-used so far in the New 52 -- though at points even I felt maybe there was too much Clark here. Johnson's actual "Psi-War," once the book gets to it, is a fairly rousing story (conceptually if not in practice), but the good Clark focus also makes for slow-going to get there, and the eventual absence of artist Kenneth Rocafort definitely detracts. Ultimately, however, I really like Lobdell's iteration of Superman, and that's enough to keep me enthusiastic about the half-dozen or so issues left in his run after this book. Lobdell uses Lois, Jimmy, and Perry better than they have been in the first two New 52 Superman volumes. Lobdell's Lois really shines here, and I thought Lobdell also illustrated Clark and Lois's current relationship, and what it means that they're "best friends," better than it's been addressed so far in the New 52. It's Lobdell's unenviable task to normalize the improbable Superman/Wonder Woman relationship begun in Justice League, but Lobdell does well both in an awkward dinner party where "Diana Prince" meets Clark's Daily Planet colleagues, and also when Wonder Woman comes to Superman's aid to fight a "menace" that turns out to be the New God Orion. This dinner party, however, is emblematic of Psi-War's extended slow start. I'm a Lois and Clark fan from way back (digital comic series, please!) and I don't mind Clark and the Daily Planet played as a workplace drama, but an entire issue where the greatest threat is Clark's supporting cast acting out of character doesn't get my pulse racing. This is preceded by an issue where Superman mainly catches people jumping off rooftops, and followed by an issue where Superman fights Orion (when we know it's a misunderstanding) and an issue where Superman confronts his friends acting strangely for a second time. I appreciate that Lobdell demonstrates the mental attacks of villain Hector Hammond and others through the characters' emotions and not something more overwrought, but it struck me as too much of Clark thinking about stuff and not enough Clark or Superman involved in real intrigue. With Psi-War, Johnson contributes to a long-standing tradition of Superman "wars," no less than the "Blaze/Satanus War," "Fall of Metropolis," Our Worlds at War, War of the Supermen, and so on. And the "Psi-War" acquits itself well, most specifically when it becomes not a two-front but rather a three-front war; the story would seem to be about Superman versus Hector Hammond and the HIVE Queen, but Johnson complicates it in a surprising manner when he introduces the new Psycho Pirate. I appreciated that Johnson and Lobdell tied the whole thing back to the Twenty, Metropolis citizens mutated by Brainiac, such that these threats feel intrinsically Superman's rather than just villains that he's fighting. At the same time, while the Queen and Psycho Pirate, as part of the Twenty, have believable motivations, I felt Hammond came off as a typical scheming bad guy, without the truly creepy, stalker-esque persona he had in Geoff Johns's early Green Lantern stories. We also lose Rocafort here for a series of fill-in artists; while the Psycho Pirate's presence is compelling, his actual visual design by a fill-in artist is overdone in a way that makes the entire "Psi-War" threat feel less serious and engaging. What sells Psi-War for me, in the end, is Lobdell's Clark Kent and Superman. If we set aside Clark's melodramatic march out of the Daily Planet in Superman Vol. 3: Fury at World's End (chalk it up to Lobdell's first Superman at bat), what we find is a likable young guy, a journalist at heart despite having left his job, and with friends he cares about and who care about him. Lobdell's Superman/Wonder Woman relationship doesn't dwell as much on grand superheroics as just on two outsiders who like each other and get along well. Clark here is not perfect, using his powers we might say inappropriately to help his partner Cat Grant get a story, but indeed I don't mind a Superman a bit more realistically fallible (and I'm not sure Dean Cain's Superman wouldn't have done the same). And Lobdell's Superman, in contrast to a number of other Supermans, flies in planes and ride subways and makes coffee in a coffee pot specifically because he could do otherwise, but wants to keep his connection to humanity. That Superman cures diseases in the Fortress of Solitude has become something of the de rigueur depiction of Superman these days, but Lobdell's is a wise and kind take that I think distinguishes his run even though it ends after the next volume. Between Superman Vol. 4: Psi-War and Action Comics Vol. 4: Hybrid, the latter is the better book, with satisfying stories that test both Clark and Superman, well-illustrated to boot. But Scott Lobdell and Mike Johnson's Psi-War succeeds in many ways that the New 52 Superman books have not so far, and both books lead me to feel that Superman is more on track than he has been in a while. It's a bit odd that Lobdell spent so many issues building up to the Psi-War and then, by the time the actual event came along, Johnson had to fill in for him. I guess he needed some time off to plot the entire "Krypton Returns" crossover. That was odd, though it seems to me about the time Lobdell had to step off Superman was when he was writing fill-in issues for the absent Andy Diggle on Action, so that's another potential explanation.